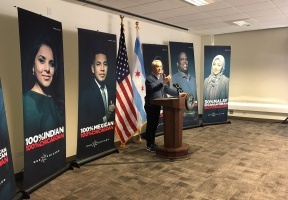 Mayor Rahm Emanuel joined community volunteers and city leaders to announce that Chicago’s Legal Protection Fund has served a record 50,000 immigrants through community based outreach, education, legal consultations and courtroom representation – surpassing all second year goals. The National Immigrant Justice Center (NIJC) provides the legal screenings and representation for the Fund with the pro bono support from more than 10 local law firms. According to a report by the American Immigration Council, even though immigrants who have lawyers are nearly ﬁve times more likely to win their cases than those without lawyers, the U.S. government does not offer appointed counsel to immigrants facing deportation. Partnering organizations include: Centro de Trabajadores Unidos, Centro Romero, Erie Neighborhood House, Hana Center, Indo-American Center, Instituto del Progreso Latino, National Partnership for New Americans, Southwest Organizing Project, and United African Organization. Administered through the Heartland Alliance National Immigrant Justice Center (NIJC) and the Resurrection Project. 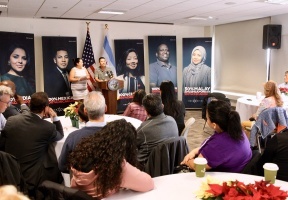 New data released today by New American Economy (NAE) and the Illinois Business Immigration Coalition shows that immigrants represented 36 percent of entrepreneurs in Chicago and generated $659 million in business income in 2016. The report also shows that immigrants held nearly a quarter of the spending power among the city’s residents, earned nearly $17 billion in household income, and paid $6 billion in taxes in 2016.